2014 was a great year for Alzheimer’s advocacy and breakthroughs. Here are some moments that made 2014 a great year for Alzheimer’s awareness. While there’s still a lot of work we need to do in 2015, here are some moments from the past year that inspired us. Thanks to some of these breakthroughs, we will see the end of this disease in our lifetime. While only 2 U.S. senators showed up to hear the speech, in the span of 24 hours, 800,000 people had watched the video of it on YouTube, and to date it has 6.7 million views and counting. 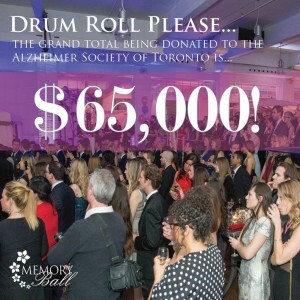 2.March – 2014 Memory Ball raises $65,000 for the Alzheimer Society of Toronto. Why yes, we had to include some self-promotion in this blog post! But really, we are truly amazed by how much people in this city care about this disease. We know that as Seth Rogen says, if we keep shouting about Alzheimer’s disease, we will end this disease once and for all in our lifetime. 3. May 2014 – Kenneth Shinozuka, 15, creates a simple way to stop his grandfather from wandering at night and enters his project into the Google Science Fair, becoming a finalist. Many of us using wearable tech to track our fitness or sleep patterns, but there’s more to this technology than just seeing if you reached your 10,000 step goal. Kenneth, an enterprising 15 year old, uses the technology to track when his grandfather gets out of bed and prevents him from wandering at night. 4. May 2014 – Baycrest, MaRs and more got together to create the Cogniciti brain test. The free test is meant to gauge if your memory is normal. It’s aimed at people between the ages of 50 and 79. With this test, people can see if their score indicates they should be seeking medical help for their memory. 5. December 2014 – As we close off the year and look back, the Alzheimer Nederland created a thought-provoking video of what it’s like to have Alzheimer’s. The video now has over 1.3 million views and capitalized on Google’s annual Search Zeitgeist to help create empathy for people with Alzheimer’s. Looking forward to 2015, we hope you’ll purchase a ticket to Memory Ball 2015 at Palais Royale! Tickets go on sale on January 1st!